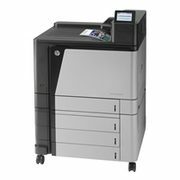 Save big on the HP Color LaserJet Enterprise M855xh Printer and bring it home for $4799.99. That's $1500 in savings! This printer comes with 3 trays, an internet connection, Hi-Speed USB 2.0, and can print up to 175,000 pages in black and in colour at 45ppm. Offer is available until April 30. All orders ship for free. Quantities are limited so shop now while supplies last.